Do you believe that life is an endless cycle where you come back in another form after you are dead? The concept of reincarnation is also referred to as transmigration or rebirth and is part of the Samsara doctrine of cyclic existence. Here are some reincarnation quotes to highlight some major thoughts on this concept. 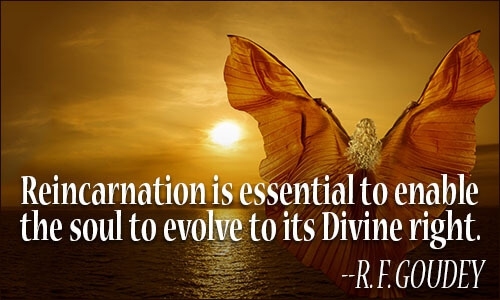 Reincarnation is a process of evolution of the soul. You will be reborn over and over. Your loved ones will come back in another form. Reincarnation impacts on our ethics and relationships with others. Children are evidence of reincarnation. It is a dance to the rhythm of the universe. It's the most comforting explanation of life. I'm neither the first nor the last version of me. I'll live my life doing good even though I might not come back as royalty in my next life. Life is a continuous cycle of birth and death. Each of our existence is bound to the rest by our virtues. God sends us back over and over again. You’re a manifestation of what you have been in all your previous lives. Your actions now will determine how you live your next life. Reincarnation quotes hold the view that we all go through a previous life. When the soul leaves your body it finds another.